Another of my photographs recently uploaded to flickr. 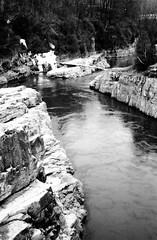 This one was taken in Winooski, VT, just below the dam. That day, the dam was closed, so the rocks along the bank were visible. When the dam is open, the water floods through and covers them.